March | 2013 | LIT.GAZ. I’m sure other people buy books because they feel they ought to read them, and then leave them on a pile for ages: this novel sat for ten years awaiting my attentions! I’d heard it praised in various quarters, and yet in the end I was deeply disappointed. Yes, I could appreciate the various modernist aspects, the shifting timeframe and the unreliable narrator, but I couldn’t appreciate the superficial and pointless characters, none of whom really engaged my attention or sympathies in the least. And yet, I was glad I’d read the book… I feel confused, as if I’ve missed something, and am beginning to think that I’ll have to go back to it and re-read – though maybe in another ten years. This unsatisfactory experience takes me back to two key questions: firstly, what literature will survive to be read by future generations and why? – to which there is clearly no obvious and straightforward answer, and, secondly, why does so much English literature annoy me? By this I mean that, to me, what is being written in other lands – European and world-wide – is often more interesting, engaging , relevant, than what is being originally written in England or in English. None of my top three novels of the twentieth century is an English novel. I know I’m generalising, maybe ridiculously, here, and yet… no-one can know all literature, there’s just too much of it; everyone therefore selects and gets to know and like various aspects, and defends them against all-comers. I’ve spent much time exploring East European literature, especially that from the Soviet era, I’ve read fairly widely in other areas, too, including science fiction and utopian literature. I suppose this means I like my literature to engage with ideas and history as well as characters, perhaps in a way that I don’t feel English literature has done. So, even though I think I’m probably missing something, I’d need another existence to explore it. I recently re-read the diaries. They are the complete antithesis to The Diary Of Anne Frank – very long, full of the minutiae of the life of a Jew under the Nazi regime, written by a middle-aged male academic who ultimately survives. The sheer, grinding awfulness of daily life and the incremental torments inflicted on the Jews are inescapable. Even reading the book is a test of endurance, but a necessary one: these times must not be forgotten. An academic sidelined from his work because of his race, he nevertheless worked continuously in secret and most of his work was saved; it’s LTI (Lingua Tertii Imperii, or, The Language of the Third Reich) that I found most interesting. 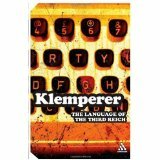 He chronicles the changes and developments of the German language during the Nazi period specific to the regime and its purposes, in detail and with examples, clearly aware of how language can manipulate and be manipulated, in the same way that George Orwell wrote about English, and imagined its future in Newspeak. This I found fascinating: it’s not possible to love literature without being caught be all sorts of details about languages, links and connections with other places and so on. Neither work is easy going; both are important and worth the effort. At the end, I was full of admiration for his stamina and determination: he was going to document his times and his experiences to the end. This novel – first of a trilogy – was a sensation when it was first published in the early days of glasnost and perestroika. But then it was overtaken by events – the end of the Soviet Union – and it took five years before the second volume was translated, and the third appeared a few years later, but only in the USA, as far as I’m aware. I had never read the third volume, so there was an excuse to revisit all three. Rybakov paints a detailed, convincing and frightening picture of the gradual unfolding of the Stalinist purges and show trials of the nineteen-thirties, against a backdrop of the youthful enthusiasm of its main characters for the construction of a new and better society, which was warped and destroyed by the tyrant. This enthusiasm is genuine and reminds us that there are other ways of building our world, that socialism has never really had a fair trial, and to beware of leaders. There may be a touching naivete – with hindsight – about the students and Komsomol members – but they want their world to be different and are committed. And not all the older people are cynics and manipulators. 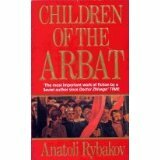 Children of the Arbat begins in 1934 with the hero in trouble and eventually exiled as the atmosphere of the times becomes ever more paranoid and menacing; he is probably saved by being sent to the depths of Siberia. In Fear, the second volume, the real madness of the times is brilliantly developed as Rybakov dares to create a convincing picture of Stalin through internal monologues; we see the increasingly twisted mind plot the destruction of rivals, potential rivals and anyone who has crossed him; we see the evil that is the NKVD grow in power and eventually consume its own, and we also see how Stalin is weakening his own country in the face of the growing Nazi threat, by destroying his best military talent. In Dust and Ashes, Stalin struggles to face the Nazi double-cross, and the nation pulls together in the face of evil. The story of our hero works towards an inevitable tragic conclusion, and I was interested that a critic had referred to it as a Soviet Romeo and Juliet. The trilogy is as long as War and Peace, and just as gripping in its own way. It’s a creation of its times which deserves to survive as more generations grow who never knew the Soviet Union, Stalin and the Cold War and only come across them now as headings in a history textbook. It’s ambitious and convincing in its sweep, and makes an effective contrast with the much narrower and more concentrated focus of Vassily Grossman’s Life and Fate. One of the tests of ‘good’ literature’ is whether it survives to be read by subsequent generations, and picking out those texts which will endure is not easy. At some point in the future, theses will be written on the creature that was Soviet Literature. The dross that was soviet realist hackwork will be forgotten, but the works produced by those times, which had to wait to be published, or be published abroad, deserve to be preserved for the future, to remind us about both dreams and tyrants. I’ve decided to wake this blog up and try and do it properly, rather than in the desultory fashion thus far. I’m reading lots and thinking about it, too, so can spread my net rather wider than I did in my earlier attempts, too. Retirement has meant I want to revisit a lot of the books I read ages ago, and there’s time to do that. Equally, I’m coming across books that I know I will never want to read again, and it’s time to clear them out. I’ve also embraced the idea of an e-reader. I couldn’t cope with anything with as daft a name as ‘kindle’ and didn’t want to be tied to how amazon does things, so I was glad when the nook became available in the UK. It means I can track down free versions of lots of old travel journals and read them, saving a huge amount of money, too. However, I’ve discovered that reading e-books isn’t as simple as it looks. Yes, I can put PDF files on the nook, but they often don’t show up if the scans are faint, and if I try & change the font size to make them readable, all sorts of weird things happen. Books in ePUB format are just as strange; yes, changing font size is easy, but every bit of text is in the same font and footnotes end up jumbled in with, and indistinguishable from, the main body of text.